Single High Sleeper 3' 0" bed frame in solid pine. Colour antique pine finish. Ladder can be fitted in a central position or to the left or right hand sides. Please note: Mattress is not included with this product. This item requires easy home assembly. Single High Sleeper 3' 0" bed frame in solid pine. 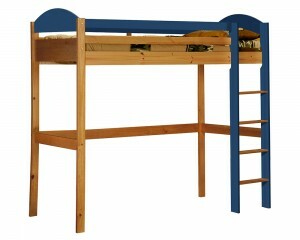 Colour antique pine finish with blue mdf head, foot board, safety rails and ladder. Ladder can be fitted in a central position or to the left or right sides. Single High Sleeper 3' 0" bed frame in solid pine. Colour antique pine finish with fuchsia mdf head, foot board, safety rails and ladder. Ladder can be fitted in a central position or to the left or right hand sides. Single High Sleeper 3' 0" bed frame in solid pine. Colour antique pine finish with graphite mdf head, foot board, safety rails and ladder. Ladder can be fitted on the left or right hand side. Single High Sleeper 3' 0" bed frame in solid pine. Colour antique pine finish with lilac mdf head, foot board, safety rails and ladder. Ladder can be fitted in a central position or to the left or right hand sides. Single High Sleeper 3' 0" bed frame in solid pine. 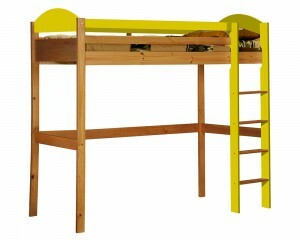 Colour antique pine finish with lime mdf head, foot board, safety rails and ladder. Ladder can be fitted in a central position or to the left or right hand sides. Single High Sleeper 3' 0" bed frame in solid pine. Colour antique pine finish with orange mdf head, foot board, safety rails and ladder. Ladder can be fitted in a central position or to the left or right hand sides. Single High Sleeper 3' 0" bed frame in solid pine. Colour antique pine finish with pink mdf head, foot board, safety rails and ladder. Ladder can be fitted in a central position or to the left or right hand sides. Single High Sleeper 3' 0" bed frame in solid pine. Colour antique pine finish with red mdf head, foot board, safety rails and ladder. Ladder can be fitted in a central position or to the left or right hand sides. 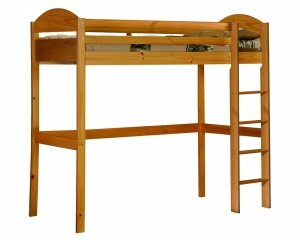 Single High Sleeper 3' 0" bed frame in solid pine. Colour antique pine finish with white mdf head, foot board, safety rails and ladder. Ladder can be fitted in a central position or to the left or right hand sides.